The effects of temperature on enzyme activity. Top - increasing temperature increases the rate of reaction (Q10 coefficient). Middle - the fraction of folded and functional enzyme decreases above its denaturation temperature. Bottom - consequently, an enzyme's optimal rate of reaction is at an intermediate temperature. Process of partial or total alteration of the native secondary, and/or tertiary, and/or quaternary structures of proteins or nucleic acids resulting in a loss of bioactivity. Note 1: Modified from the definition given in ref. Note 2: Denaturation can occur when proteins and nucleic acids are subjected to elevated temperature or to extremes of pH, or to nonphysiological concentrations of salt, organic solvents, urea, or other chemical agents. Note 3: An enzyme loses its catalytic activity when it is denaturized. Denaturation is a process in which proteins or nucleic acids lose the quaternary structure, tertiary structure, and secondary structure which is present in their native state, by application of some external stress or compound such as a strong acid or base, a concentrated inorganic salt, an organic solvent (e.g., alcohol or chloroform), radiation or heat. If proteins in a living cell are denatured, this results in disruption of cell activity and possibly cell death. Protein denaturation is also a consequence of cell death. Denatured proteins can exhibit a wide range of characteristics, from conformational change and loss of solubility to aggregation due to the exposure of hydrophobic groups. Denatured proteins lose their 3D structure and therefore cannot function. Protein folding is key to whether a globular or membrane protein can do its job correctly; it must be folded into the right shape to function. However, hydrogen bonds, which play a big part in folding, are rather weak and thus easily affected by heat, acidity, varying salt concentrations, and other stressors which can denature the protein. This is one reason why tight homeostasis is physiologically necessary in many life forms. This concept is unrelated to denatured alcohol, which is alcohol that has been mixed with additives to make it unsuitable for human consumption. 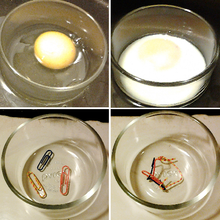 (Top) The protein albumin in the egg white undergoes denaturation and loss of solubility when the egg is cooked. (Bottom) Nitinol paperclips provide a visual analogy to help with the conceptualization of the denaturation process. A classic example of denaturing in proteins comes from egg whites, which are typically largely egg albumins in water. Fresh from the eggs, egg whites are transparent and liquid. Cooking the thermally unstable whites turns them opaque, forming an interconnected solid mass. The same transformation can be effected with a denaturing chemical. Pouring egg whites into a beaker of acetone will also turn egg whites translucent and solid. The skin that forms on curdled milk is another common example of denatured protein. The cold appetizer known as ceviche is prepared by chemically "cooking" raw fish and shellfish in an acidic citrus marinade, without heat. Denatured proteins can exhibit a wide range of characteristics, from loss of solubility to protein aggregation. Proteins or Polypeptides are polymers of amino acids. A protein is created by ribosomes that "read" RNA that is encoded by codons in the gene and assemble the requisite amino acid combination from the genetic instruction, in a process known as translation. The newly created protein strand then undergoes posttranslational modification, in which additional atoms or molecules are added, for example copper, zinc, or iron. Once this post-translational modification process has been completed, the protein begins to fold (sometimes spontaneously and sometimes with enzymatic assistance), curling up on itself so that hydrophobic elements of the protein are buried deep inside the structure and hydrophilic elements end up on the outside. The final shape of a protein determines how it interacts with its environment. Protein folding consists of a balance between a substantial amount of weak intra-molecular interactions within a protein (Hydrophobic, electrostatic, and Van Der Waals Interactions) and protein-solvent interactions. As a result, this process is heavily reliant on environmental state that the protein resides in. These environmental conditions include, and are not limited to, temperature, salinity, pressure, and the solvents that happen to be involved. Consequently, any exposure to extreme stresses (e.g. heat or radiation, high inorganic salt concentrations, strong acids and bases) can disrupt a protein's interaction and inevitably lead to denaturation. When a protein is denatured, secondary and tertiary structures are altered but the peptide bonds of the primary structure between the amino acids are left intact. Since all structural levels of the protein determine its function, the protein can no longer perform its function once it has been denatured. This is in contrast to intrinsically unstructured proteins, which are unfolded in their native state, but still functionally active and tend to fold upon binding to their biological target. Van der Waals (induced dipole) interactions between nonpolar amino acid side-chains. Most biological substrates lose their biological function when denatured. For example, enzymes lose their activity, because the substrates can no longer bind to the active site, and because amino acid residues involved in stabilizing substrates' transition states are no longer positioned to be able to do so. The denaturing process and the associated loss of activity can be measured using techniques such as dual polarization interferometry, CD, QCM-D and MP-SPR. By targeting proteins, heavy metals have been known to disrupt the function and activity carried out by proteins. It is important to note that heavy metals fall into categories consisting of transition metals as well as a select amount of metalloid. These metals, when interacting with native, folded proteins, tend to play a role in obstructing their biological activity. This interference can be carried out in a different number of ways. These heavy metals can form a complex with the functional side chain groups present in a protein or form bonds to free thiols. Heavy metals also play a role in oxidizing amino acid side chains present in protein. Along with this, when interacting with metalloproteins, heavy metals can dislocate and replace key metal ions. As a result, heavy metals can interfere with folded proteins, which can strongly deter protein stability and activity. In many cases, denaturation is reversible (the proteins can regain their native state when the denaturing influence is removed). This process can be called renaturation. This understanding has led to the notion that all the information needed for proteins to assume their native state was encoded in the primary structure of the protein, and hence in the DNA that codes for the protein, the so-called "Anfinsen's thermodynamic hypothesis". Denaturation can also be irreversible. This irreversibility is typically a kinetic, not thermodynamic irreversibility, as generally when a protein is folded it has lower free energy. Through kinetic irreversibility, the fact that the protein is stuck in a local minimum can stop it from ever refolding after it has been irreversibly denatured. Denaturation can also be caused by changes in the pH which can affect the chemistry of the amino acids and their residues. The ionizable groups in amino acids are able to become ionized when changes in pH occur. A pH change to more acidic or more basic conditions can induce unfolding. Acid-induced unfolding often occurs between pH 2 and 5, base-induced unfolding usually requires pH 10 or higher. Nucleic acids (including RNA and DNA) are nucleotide polymers synthesized by polymerase enzymes during either transcription or DNA replication. Following 5'-3' synthesis of the backbone, individual nitrogenous bases are capable of interacting with one another via hydrogen bonding, thus allowing for the formation of higher-order structures. Nucleic acid denaturation occurs when hydrogen bonding between nucleotides is disrupted, and results in the separation of previously annealed strands. For example, denaturation of DNA due to high temperatures results in the disruption of Watson and Crick base pairs and the separation of the double stranded helix into two single strands. Nucleic acid strands are capable of re-annealling when "normal" conditions are restored, but if restoration occurs too quickly, the nucleic acid strands may re-anneal imperfectly resulting in the improper pairing of bases. DNA denaturation occurs when hydrogen bonds between Watson and Crick base pairs are disturbed. The non-covalent interactions between antiparallel strands in DNA can be broken in order to "open" the double helix when biologically important mechanisms such as DNA replication, transcription, DNA repair or protein binding are set to occur. The area of partially separated DNA is known as the denaturation bubble, which can be more specifically defined as the opening of a DNA double helix through the coordinated separation of base pairs. The first model that attempted to describe the thermodynamics of the denaturation bubble was introduced in 1966 and called the Poland-Scheraga Model. This model describes the denaturation of DNA strands as a function of temperature. As the temperature increases, the hydrogen bonds between the Watson and Crick base pairs are increasingly disturbed and "denatured loops" begin to form. However, the Poland-Scheraga Model is now considered elementary because it fails to account for the confounding implications of DNA sequence, chemical composition, stiffness and torsion. Recent thermodynamic studies have inferred that the lifetime of a singular denaturation bubble ranges from 1 microsecond to 1 millisecond. This information is based on established timescales of DNA replication and transcription. Currently,[when?] biophysical and biochemical research studies are being performed to more fully elucidate the thermodynamic details of the denaturation bubble. Formamide denatures DNA by disrupting the hydrogen bonds between Watson and Crick base pairs. Orange, blue, green, and purple lines represent adenine, thymine, guanine, and cytosine respectively. The three short black lines between the bases and the formamide molecules represent newly formed hydrogen bonds. With polymerase chain reaction (PCR) being among the most popular contexts in which DNA denaturation is desired, heating is the most frequent method of denaturation. Other than denaturation by heat, nucleic acids can undergo the denaturation process through various chemical agents such as formamide, guanidine, sodium salicylate, dimethyl sulfoxide (DMSO), propylene glycol, and urea. These chemical denaturing agents lower the melting temperature (Tm) by competing for hydrogen bond donors and acceptors with pre-existing nitrogenous base pairs. Some agents are even able to induce denaturation at room temperature. For example, alkaline agents (e.g. NaOH) have been shown to denature DNA by changing pH and removing hydrogen-bond contributing protons. These denaturants have been employed to make Denaturing Gradient Gel Electrophoresis gel (DGGE), which promotes denaturation of nucleic acids in order to eliminate the influence of nucleic acid shape on their electrophoretic mobility. The optical activity (absorption and scattering of light) and hydrodynamic properties (translational diffusion, sedimentation coefficients, and rotational correlation times) of formamide denatured nucleic acids are similar to those of heat-denatured nucleic acids. Therefore, depending on the desired effect, chemically denaturing DNA can provide a gentler procedure for denaturing nucleic acids than denaturation induced by heat. Studies comparing different denaturation methods such as heating, beads mill of different bead sizes, probe sonification, and chemical denaturation show that chemical denaturation can provide quicker denaturation compared to the other physical denaturation methods described. Particularly in cases where rapid renaturation is desired, chemical denaturation agents can provide an ideal alternative to heating. For example, DNA strands denatured with alkaline agents such as NaOH renature as soon as phosphate buffer is added. Small, electronegative molecules such as nitrogen and oxygen, which are the primary gases in air, significantly impact the ability of surrounding molecules to participate in hydrogen bonding. These molecules compete with surrounding hydrogen bond acceptors for hydrogen bond donors, therefore acting as "hydrogen bond breakers" and weakening interactions between surrounding molecules in the environment. Antiparellel strands in DNA double helices are non-covalently bound by hydrogen bonding between Watson and Crick base pairs; nitrogen and oxygen therefore maintain the potential to weaken the integrity of DNA when exposed to air. As a result, DNA strands exposed to air require less force to separate and exemplify lower melting temperatures. ^ Alan D. MacNaught; Andrew R. Wilkinson, eds. (1997). Compendium of Chemical Terminology: IUPAC Recommendations (the "Gold Book"). Blackwell Science. ISBN 978-0865426849. ^ Vert, Michel (2012). "Terminology for biorelated polymers and applications (IUPAC Recommendations 2012)" (PDF). Pure and Applied Chemistry. 84 (2): 377–410. doi:10.1351/PAC-REC-10-12-04. ^ Samson, Andre L.; Ho, Bosco; Au, Amanda E.; Schoenwaelder, Simone M.; Smyth, Mark J.; Bottomley, Stephen P.; Kleifeld, Oded; Medcalf, Robert L. (2016-11-01). "Physicochemical properties that control protein aggregation also determine whether a protein is retained or released from necrotic cells". Open Biology. 6 (11): 160098. doi:10.1098/rsob.160098. ISSN 2046-2441. PMC 5133435. PMID 27810968. ^ Mine, Yoshinori; Noutomi, Tatsushi; Haga, Noriyuki (1990). "Thermally induced changes in egg white proteins". Journal of Agricultural and Food Chemistry. 38 (12): 2122–2125. doi:10.1021/jf00102a004. ^ "Ceviche: the new sushi," The Times. ^ a b c Bondos, Sarah (2014). "Protein folding". Access Science. doi:10.1036/1097-8542.801070. ^ "Denaturation". Science in Context. 2006-04-03. ^ Dyson, H. Jane; Wright, Peter E. (2005-03-01). "Intrinsically unstructured proteins and their functions" (PDF). Nature Reviews Molecular Cell Biology. 6 (3): 197–208. doi:10.1038/nrm1589. ISSN 1471-0072. PMID 15738986. ^ a b c d e f Tamás, Markus J.; Sharma, Sandeep K.; Ibstedt, Sebastian; Jacobson, Therese; Christen, Philipp (2014-03-04). "Heavy Metals and Metalloids As a Cause for Protein Misfolding and Aggregation". Biomolecules. 4 (1): 252–267. doi:10.3390/biom4010252. PMC 4030994. PMID 24970215. ^ Wetlaufer, D.B. (1988). "Reversible and irreversible denaturation of proteins in chromatographic systems". Makromolekulare Chemie. Macromolecular Symposia. 17 (1): 17–28. doi:10.1002/masy.19880170104. ISSN 0258-0322. ^ a b Konermann, Lars (2012-05-15). Protein Unfolding and Denaturants. eLS. Chichester, UK: John Wiley & Sons, Ltd. doi:10.1002/9780470015902.a0003004.pub2. ISBN 978-0470016176. ^ a b Sicard, François; Destainville, Nicolas; Manghi, Manoel (21 January 2015). "DNA denaturation bubbles: Free-energy landscape and nucleation/closure rates". The Journal of Chemical Physics. 142 (3): 034903. arXiv:1405.3867. Bibcode:2015JChPh.142c4903S. doi:10.1063/1.4905668. PMID 25612729. ^ Lieu, Simon. "The Poland-Scheraga Model." (2015): 0-5. Massachusetts Institute of Technology, 14 May 2015. Web. 25 Oct. 2016. ^ Richard, C., and A. J. Guttmann. "Poland–Scheraga Models and the DNA Denaturation Transition." Journal of Statistical Physics 115.3/4 (2004): 925-47. Web. ^ a b c Altan-Bonnet, Grégoire; Libchaber, Albert; Krichevsky, Oleg (1 April 2003). "Bubble Dynamics in Double-Stranded DNA". Physical Review Letters. 90 (13): 138101. Bibcode:2003PhRvL..90m8101A. doi:10.1103/physrevlett.90.138101. PMID 12689326. ^ a b c d Wang, X (2014). "Characterization of denaturation and renaturation of DNA for DNA hybridization". Environmental Health and Toxicology Environ Health Toxicol. 29: e2014007. doi:10.5620/eht.2014.29.e2014007. PMC 4168728. PMID 25234413. ^ a b Marmur, J (1961). "Denaturation of deoxyribonucleic acid by formamide". Biochimica et Biophysica Acta. 51 (1): 91013–7. doi:10.1016/0006-3002(61)91013-7. ^ "Denaturing Polyacrylamide Gel Electrophoresis of DNA & RNA". Electrophoresis. National Diagnostics. Retrieved 13 October 2016. ^ Tinoco, I; Bustamante, C; Maestre, M (1980). "The Optical Activity of Nucleic Acids and their Aggregates". Annual Review of Biophysics and Bioengineering. 9 (1): 107–141. doi:10.1146/annurev.bb.09.060180.000543. PMID 6156638. ^ Fernandes, M (2002). "Calculation of hydrodynamic properties of small nucleic acids from their atomic structure". Nucleic Acids Research. 30 (8): 1782–8. doi:10.1093/nar/30.8.1782. PMC 113193. PMID 11937632. ^ a b Mathers, T. L.; Schoeffler, G.; McGlynn, S. P. (July 1985). "The effects of selected gases upon ethanol: hydrogen bond breaking by O and N". Canadian Journal of Chemistry. 63 (7): 1864–1869. doi:10.1139/v85-309. ^ Cox, David L. Nelson, Michael M. (2008). Lehninger principles of biochemistry (5th ed.). New York: W.H. Freeman. ISBN 9780716771081. ^ a b Mathers, T. L.; Schoeffler, G.; McGlynn, S. P. (1982). "Hydrogen-bond breaking by O/sub 2/ and N/sub 2/. II. Melting curves of DNA". doi:10.2172/5693881. ^ Jaremko, M.; Jaremko Ł; Kim HY; Cho MK; Schwieters CD; Giller K; Becker S; Zweckstetter M. (April 2013). "Cold denaturation of a protein dimer monitored at atomic resolution". Nat. Chem. Biol. 9 (4): 264–70. doi:10.1038/nchembio.1181. PMC 5521822. PMID 23396077.